physical oceanography – Real Science at SOEST! HAS MOVED! In oceanographic research, we plan, hypothesize, and make observations as carefully as we can, but nature can still sometimes find ways to mess with us. After all, research is about investigating scientific mysteries, so we never really know what we’re going to find. That’s not a drawback to research—it’s a feature. Sometimes, the most exciting scientific mysteries are the ones that lead in a direction we never expected, as I learned in a recent study of Māmala Bay. As a physical oceanographer, I study internal waves. These are underwater waves that can be found throughout most of the ocean. Similar to how surface ocean waves travel on the interface between two fluids of different densities (those two fluids being the water and the much less dense air above it), internal waves can move through water that has different densities at different depths. In the ocean, the main properties affecting water density are temperature and salinity, so generally less dense (warmer and/or fresher) water sits on top of denser (colder and/or saltier) water. Any disturbance to this structure, such as a current forcing water up and over an underwater ridge, can create internal waves that move through the water. We don’t see these internal waves with the naked eye, but we can detect them with underwater measurements of water properties such as temperature and velocity. For six months, I had a sensor deployed in Māmala Bay at 500 m depth to look for internal waves. This sensor, called an ADCP (acoustic Doppler current profiler), measures water velocity using sonar: it sends out a brief pulse of sound through the water column, and the sound bounces back off of tiny particles drifting in the water at different distances from the ADCP. The time it takes for the sound waves to bounce back tells the ADCP how far away each particle is, and the amount of sound that returns to the sensor (the “backscatter”) gives a relative estimate of how many particles are in the water at different depths. The Doppler shift of the sound that returns gives a reading of the velocity of the drifting particles and, thus, the velocity of the water in which they are drifting. In order to get a good velocity reading, though, there need to be a sufficient number of particles in the water for enough of the sound to bounce back and return to the sensor. Once my ADCP was hauled out of the ocean and back to the lab, I started to look at the data it collected. I used a method that essentially highlights repeating patterns in the data and the frequencies at which the patterns repeat. This type of analysis is useful when looking for signs of internal waves, because waves are themselves a repeating pattern. When I did this analysis, it showed a lot of activity occurring at a frequency of about one cycle per day. My experience with internal waves initially led me to think that this was a strong tidal signal, since many internal waves oscillate at tidal frequencies. Interesting! I might be observing an internal wave with a diurnal tidal frequency breaking at this location! But when I looked closer at the velocity readings, I realized that things were not what they seemed to be. Animals are messing up my data! When I looked more closely at my data, I saw that my “interesting” velocity signal was actually a false signal—an artifact of the ADCP receiving poor data. The ADCP had recorded consistently high backscatter near the bottom during daylight hours, but low backscatter at night. This means that during the day, the sensor received a nice, strong signal because there were lots of particles in the water for the sound to bounce off of. But during the night, the water near the bottom became incredibly clear, so the ADCP couldn’t get a good velocity signal. For the most part, the ADCP marked the weak signal as missing data as it is programmed to do. But sometimes, when the signal strength was at the border between too weak and maybe just strong enough, the ADCP recorded an unreliable jumble of numbers. The nighttime jumble was what caused my apparent “interesting” signal that was occurring at a cycle of once per day. I now knew that my hypothesis of an internal wave breaking at a diurnal tidal frequency was based on false velocity readings, but this raised a new question: Why would my velocity readings be strong during daylight hours but weak during the night? The pattern repeated itself every day. To answer this question, I had to step outside of my usual research area of physical oceanography and into the field of biological oceanography. What’s happening is that there are organisms that migrate on a daily schedule in a behavior we call “diel migration.” Tiny zooplankton, fish, squid, and shrimp feed on plankton near the surface of the water, but they are vulnerable to being eaten by larger predators when they can be seen in the light of the sun. So during the day, they hide in dark waters too deep for the light to reach. At night, they swim upwards or “migrate” into shallower water to feed under the cover of darkness, when there is a lower risk of being spotted by predators. My ADCP was located at a deep site where these animals were hiding during the day. This is why I had a high backscatter signal during daylight hours. At night, though, the animals would all move to shallower depths to feed, leaving such a low backscatter signal that the sensor couldn’t get good velocity data near the bottom. My backscatter signal was a record of diel migration! It turns out that the diel migration of these small animals in Oahu’s coastal waters is an area of active research. Previous studies have observed diel migration of these organisms, but they have mostly focused on shallower waters. I am now working with biological oceanographer Christina Comfort on a manuscript to report our observations of this migrating community of organisms. These observations could be important for the planned SWAC (Seawater Air Conditioning) system being built in Mamala Bay, as the intake pipe for the cold water feeding that cooling system is near 500 m depth and could affect or be affected by the presence of a large migrating community. 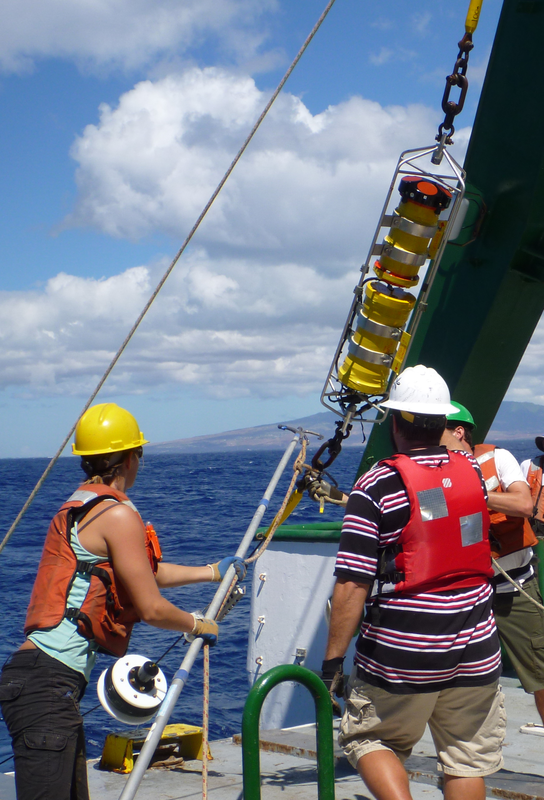 This study exemplifies why oceanographic research is an exciting, versatile line of work. Things don’t always go as planned, and data won’t always reveal what you expect, but that can be a good thing! You might find that your research takes you in a completely different direction that is still interesting in its own right. Oceanography is by nature an interdisciplinary field. 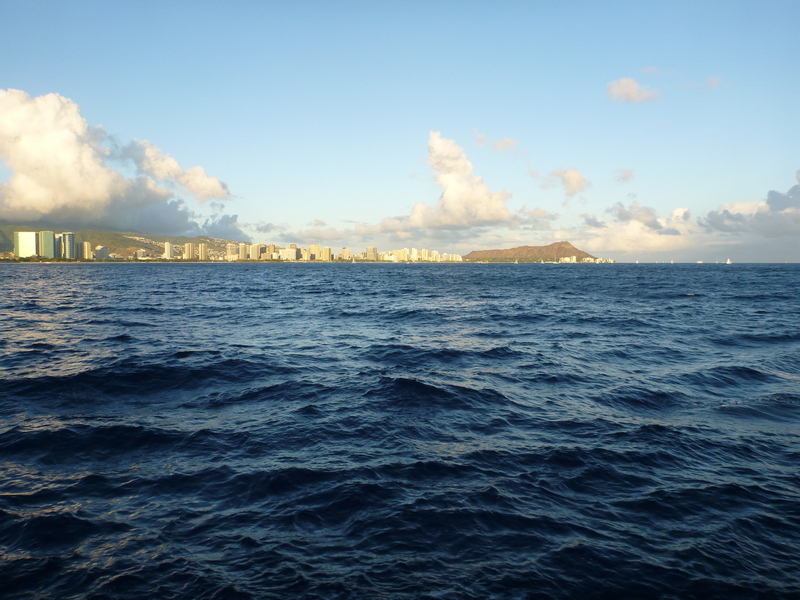 The physics, chemistry, and biology of the ocean all exist everywhere simultaneously. Being able to start a project looking for a purely physical signal in the ocean and ending up with a manuscript about the behavior of small nearshore animals—this is one of the reasons I love doing oceanographic research. 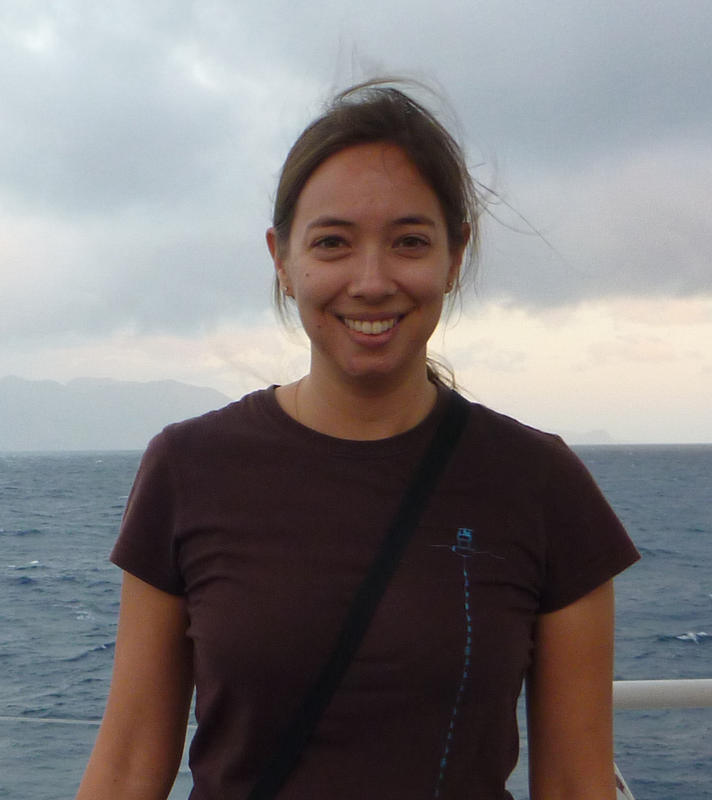 Katie Smith is a PhD candidate in the Department of Oceanography at UH Mānoa. Her research focuses on the behavior and effects of internal waves in nearshore systems, and she is also interested in the interactions between the physics and the biology of the ocean.